Please take a few moments to read about the creative engineering solutions we’ve delivered to clients across London, the south and the UK. 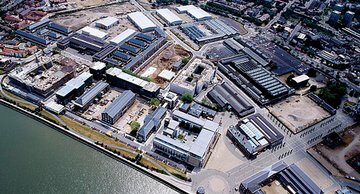 Providing a low carbon generation solution for a 76 acre development and in one of London's leading boroughs for carbon reduction, Greenwich. 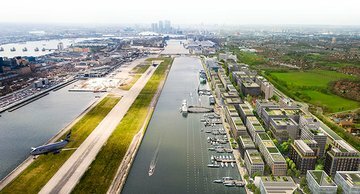 We are delighted our involvement with the Royal Arsenal Riverside Development in London is set to enter its second decade. The project has seen us develop a partnership we are particularly proud of on a project which continues to be one of the largest regeneration developments in London. The development, which is a key project under the London Plan, is being delivered by Berkeley Homes with SSE acting as the Energy Services Company (ESCo). The project sees the transformation of the former derelict 88 acre site into a vibrant community which incorporates both the refurbishment of Grade I and II listed historic buildings and the creation of bold new modern architecture, mixing the old with the new. When completed it will eventually include over 5,000 new homes, a Crossrail Station, shops, restaurants and cafes, offices, a hotel, community healthcare, nursery, and leisure. 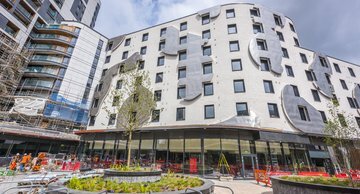 In 2007 Vital Energi was initially commissioned to design supply and install an efficient energy solution to serve 461 apartments in The Armouries, a nursery, Primary Care Trust, shops and restaurants. The energy centre would be situated adjacent to a Grade II listed building and share a party wall so we had to maintain the appearance of the building and ensure this structure was sufficient for the equipment. An initial concern was the limited access and egress for equipment due to spatial restrictions. A sensitive solution was created, with Vital overseeing the creation of two full-length louvres which enabled safe delivery and manoeuvre of equipment. The initial energy centre housed one 150kWe CHP engine, two 2MW gas boilers and one 70,000 litre thermal store. We also installed the above and below ground heating networks which distribute the hot water around the development and the in-home hydraulic interface units. The phased nature of the development required the design of an overall RIBA stage 3 district heating masterplan. Critically, this approach to design allowed us to calculate the pipe sizes to ensure optimum capacity, whilst keeping the route flexible. This allows the developer to have flexibility in the sequence of construction and bring phases forward if necessary. Additionally, developers often need to install certain areas of infrastructure early, such as pipework which would run under access or service roads, and having the overall masterplan enables our team to make these installations which then integrate with the larger system at a later date. An innovative feature of this system is that the energy centre has a twin-circuit output which means there are two operating pressure options for the district heating to connect to. The low pressure circuit feeds the first three phases of the development, with the high-pressure circuit being required for the higher tower blocks. In 2011, we connected a further 290 homes, known as The Warehouse, as well as a number of commercial buildings, including a leisure centre. At the same time, we installed a 2.5MW boiler, associated pipework, and made modifications to the building management system controls to accommodate additional heat and hot water demand. Throughout the project, Vital Energi has paid special consideration to the requirements of the local environment and the residents of adjacent buildings. This has seen us take every effort to ensure noise was kept to a minimum during the installation work. We also specified a CHP with a catalytic reduction system which reduced NOx emissions to 20mg/kWhr, which met the stringent air pollution control regulations and we carried out extensive atmospheric dispersion modelling to ensure the installation complies with the Clean Air Act legislation. In 2012, Vital Energi was commissioned by Berkeley Homes to carry out a feasibility study into extending the scope of the district heating network and energy centre to accommodate the entire future capacity of the site. The initial calculations concluded that the thermal output of the energy centre needed to be increased to accommodate a 15 MW peak load requirement for the development, resulting in the CHP capacity increasing to 2.4MWe. This was essential to meet the planning requirements which stipulated that a minimum of 65% of the site’s annual heat demand come from CHP. The study also investigated the best use of the limited available space in the energy centre for additional plant. The initial, primary challenge was that the footprint was not large enough to accommodate the full range of plant and equipment needed to deliver the increased capacity. Working closely with Berkeley Homes & SSE we created a 3-level, multi-mezzanine solution which accommodated the new plant and equipment, but still performed optimally. The steel structure also had the additional benefit of supporting the weight of the equipment, meaning none of the load was carried by the walls of the structure. The layout of plant was devised to enable a phased installation to suit the construction timetable and minimise initial expenditure whilst retaining adequate access for maintenance. Fitting the energy centre into the given footprint was commercially important as it maximised the lettable area of the development. Due to the proximity of the existing 22m high flue to the new cross rail station, accurate air dispersion calculations were required to reduce the Nitrogen Oxide (NOx) output of the system in order to meet the stringent planning requirements. Vital was also commissioned to extend the pre-insulated district heating mains, something made much simpler due to the future proofing of the scheme at the design stage. To ensure continuity of supply to the residents already living on the development, Vital Energi created a temporary energy centre which utilised the existing boilers by moving them to the temporary location. This meant that when the temporary energy centre was taken offline for the upgrades, residents’ heat and hot water continued without interruption. Vital have implemented M&E services for a total of six apartment blocks in the development. These saw our project team install a range of measures including riser and lateral packages, sprinklers, BMS controls, boosted cold water services and dry and wet firefighting risers. 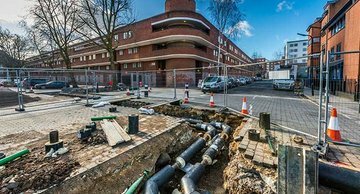 The long-term planning for the heat network was evidenced in this phase as we had previously installed the pipework through the basement carparks beneath all three blocks, which meant we did not need to dig up any roads during this phase. Our work on this latest phase included work on 266 apartments, bringing the overall total on the development to 562. Vital Energi’s involvement in this project stretches back 10 years, which has allowed a continuity of vision and we are now seeing the practical benefits of the future proofing measures incorporated into the design stage. We have worked closely with the ESCo provider, SSE, and the developer, Berkeley Homes, maintaining strong working relationships and providing input into the planning of energy provision to meet the needs of the development as it is constructed. Vital were tasked with providing a flexible energy solution for the upcoming Sugar House Island development that would be future-proofed for for further development. Sugar House Island is situated at Three Mills, adjacent to the Queen Elizabeth Olympic Park in Stratford, east London. 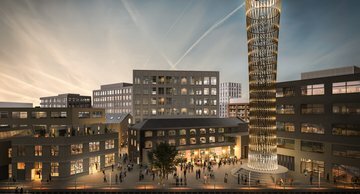 The 26-acre site will see the regeneration and renovation of a former industrial area to provide a mixed-use development consisting of 1,200 homes, 58,000m² of commercial office space and restaurants, cafés and retail units, as well as a 350-bed hotel and planning permission for a 2-form entry primary school. Vastint UK specialises in unlocking the potential of large urban sites to create truly mixed-use regeneration schemes. The company is part of Vastint, an international real estate developer with over 25 years’ experience and schemes across Europe. Vital designed and built the energy solution for the development, creating a binary approach flexible plan to enable the client to undertake negotiations with a third party energy provider whilst being assured of a fully viable back-up plan. Our design was also created to be capable of evolving as phases of the development built out and energy needs changed over time. We had to adopt a flexible design approach for the project, due to the client’s wish to futureproof the site with a connection from the development to the neighbouring Olympic Park Energy Centre, whilst also having the potential to develop into an independent CHP-led energy centre, should it be necessary in the future. Our scope has been to provide the design for the entire 26-acre development, as well as to implement the build for the first phase connecting two residential blocks. We were originally on a RIBA Stage 3 design contract to provide the solution for the development. At this stage, the client desired an on-site CHP led energy centre, which we designed to reside under a residential block. Our design consisted of two 502kWe CHPs, five 2MWe boilers, a 90m³ thermal store, a 5m³ buffer vessel, three 3MWe plate heat exchangers, and one district heating pump skid. The implementation was planned to be in phases to suit the phased nature of the development. We provided pipework modelling and sizing, along with thermal expansion reviews and heat loss calculations to maximise the benefits of the scheme. Additionally, we used 3D modelling software to coordinate the installation of the buried district heating pipe and to assist the site team with their delivery by ensuring a design free from clashes with existing underground services and building foundations. We completed clash detection workshops with the client’s project team to perfect the design, providing added confidence that the system will be faultlessly installed. The programme was planned to be implemented in phases to provide the ability to change course at later stages. We have planned this phased delivery so that it aligns with the growth of the development to allow for simultaneous progress. We planned for a sequence of sectional delivery as opposed to constant installation due to other civils infrastructure works taking place on the site. This proved challenging due to the start/stop nature of the construction, however we have stayed in control of the install to tightly manage and monitor the different sections to maintain a timely delivery for the client. Flexible design to accommodate futureproofing of the site. We were asked to provide a pre-payment energy solution for Southern Housing Group's Bow River Village development to assist residents in managing and understanding their energy consumption and costs. Southern Housing Group is one of the largest housing associations in the South of England, providing homes for more than 72,000 people. Bow River Village is a new build site which is being implemented in three phases, eventually providing over 700 homes and 100,000 sq ft. of commercial space. Located on a former industrial site in Bromley-by-Bow, the area is undergoing a large amount of regeneration. Phase 1 of the project saw the construction of 219 apartments of social housing, private lettings, and privately owned properties. 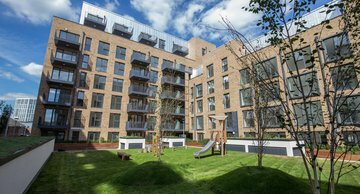 Having worked with us on previous projects at Kidbrooke, where we supplied and installed the earlier version of the vPro:ems Smart Metering System, Southern Housing Group contracted us to supply and install the new vPro2 system and provide metering and billing services for phase 1 of the development. Southern Housing Group wanted the same system to be installed in all the properties, and was the first project to benefit from the updated vPro2 system. The key features for the client of this new system is that it is more user friendly than the previous system with enhanced reporting capabilities. The client had specific requirements and objectives to fulfil through the implementation of a metering and billing system to benefit both themselves and the residents. They wanted to encourage residents to manage their energy consumption efficiently, and to only pay for the heating and hot water that they actually used rather than a pre-established monthly charge based on the size of their apartment. Additionally, Southern Housing Group wanted a system that benefitted from a Pay As You Go pre-payment scheme that had flexible topping up options to prevent issues concerning fuel debt. The vPro2 system was an ideal choice for this project due to the feature-rich in-home display that shows simple and real-time information regarding the residents’ consumption, and can help identify savings on their bills, allowing the residents to have a clearer understanding of their usage costs. The ability to set targets to try to reduce usage enhances the residents’ understanding of their consumption levels further, and helps them make informed decisions on their usage. The system displays the remaining credit value along with an estimate of the duration remaining before a top-up is required. There are various quick and easy methods to top-up the credit, using either Payzone or PayPoint, via the internet, telephone or Direct Debit. Each meter comes equipped with its own SIM card to create a separate network over which it can transmit secure and regular data, with readings taken automatically to avoid the necessity to enter residents’ apartments, allowing for the system to be used on any size communal heating scheme with little risk of network-wide issues. This would also allow for the system to be used seamlessly in future phases. We supplied and installed the technology into each property, liaising with contractors and on-site workers to ensure a seamless installation from the moment the units arrived. We installed the system straight from delivery to maximise the timescale and avoid disruption to current works. The vPro2 technology was successful in detecting issues with a third party HIU within the property, allowing the client to take necessary actions. A resident was suspecting that they were being overcharged for their energy consumption which would have usually gone undetected. Due to the monitoring capability of our technology, excess and unusual consumption was detected which allowed the housing association to raise a repair and resolve the issue. In alliance with the client and the manufacturer, a bespoke YouTube video was created which provided information on what the vPro2 system is, the benefits of this kind of metering and billing technology, and a tutorial on how to use it. A link to this video was sent to all residents to assist in using the system, as well as being uploaded onto Southern Housing Group’s website to provide future easy access to the information. Our Home Manager provided one-to-one tuition to Southern Housing Group’s Home Energy Advisor on utilising the system, ensuring that they were confident with the technology and would be able to provide residents with future assistance if they require it. We designed and supplied custom-made welcome packs for all residents that included help guides on using the system, contact numbers to offer telephone support, troubleshooting advice, and information on how to credit the meter. This ensured that residents were confident on the technology, and help was provided in all different means to suit their learning styles. As Southern Housing Group were already in the midst of a 3 year metering and billing contract with Vital at other developments, we adapted this existing agreement to incorporate Bow River Village. This was to the benefit of the client as it resulted in one simple contract with one end date to keep the management as clear as possible. We manage the metering and billing of the developments with the system wirelessly and automatically transmitting the data to us to be monitored. We are also responsible for crediting the vPro2 system once a resident has made payment, with friendly credit available when our offices are closed in the evenings, at weekends and over bank holidays when the energy supply will not be cut off if credit runs out. Our agents work hard to manage payments with a total of 1,205 transactions being made over a three month winter period via card payments, direct debits and PayZone/PayPoint, equating to £26,960. These payments are processed and monitored internally by our dedicated departments to ensure smooth operation of the system credit and management of the revenue.